Let's chat about a stroller for a hot minute. It's not a secret that 99% of all my running is done with a stroller. Fact. However what I don't share enough about is that I have tried quite a few strollers, either because I own quite a few (ummmm Dave thinks I have a stroller hoarding problem. I refuse to talk about it) or I have been able to borrow a stroller. I use the stroller for running errands to long runs to all kinds of training workouts. My strollers get put through a lot! Not only with the miles that I put on them, but also with Asher and his behaviors that come along with his disability. Let's not forget that he was able to literally break a stroller seat less than a year ago because of said behaviors. For a 25lb-ish 5 year old he seems to have Hulk type strength. Lucky for me, the awesome geniuses behind the Bumbleride stroller gave me the chance to give the Speed 8 a go! I've had the stroller for nearly 3 weeks now and it has not disappointed. 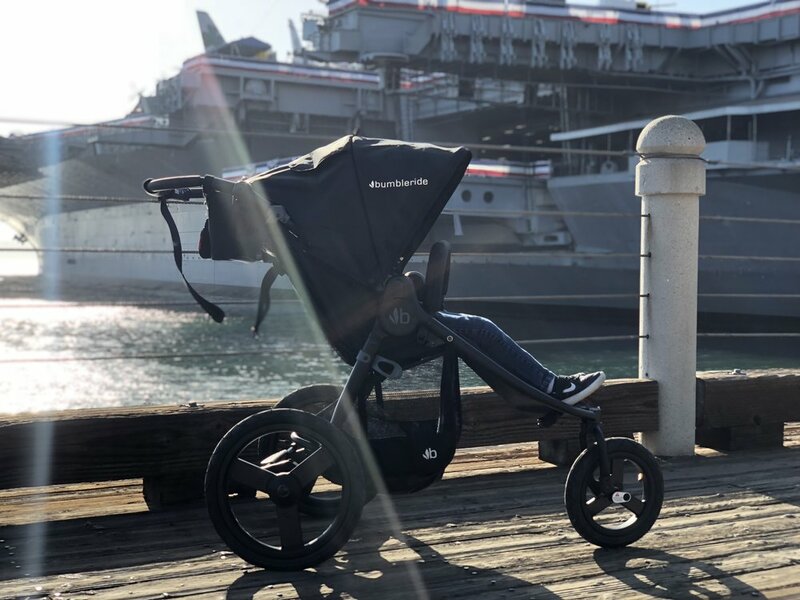 Here's the thing about this stroller that I must address first, the biggest reason I wanted to try Bumbleride has everything to do with the innovative technology Emily and Matt have utilized in creating this stroller. Their Speed stroller is made from 100% recycled PET that have kept over half a million water bottles out of landfills since 2011. How AMAZING is that? A running stroller to any parent is a life line. It is a mental, a physical and a relationship building vital tool. It gives parents the freedom to still make themselves a priority. This stroller is no exception to all that goodness but it also is good for the environment. That in itself spoke to Dave and I. We have been trying for awhile now to be more mindful with our purchases. We have shared in the past our love of supporting small and local businesses (Bumbleride is California local. Right in beautiful San Diego! ), supporting business that support a cause close to our heart (Special needs, inclusion and acceptance are big on our list) and now we want to make sure we are supporting businesses that focus on environmentally friendly practices and products. If recycled fabrics and keeping plastics from the landfill doesn't get you, then this is the ONLY stroller with 3 front wheel options. I am a big supporter of safe stroller running which means locked wheel. It offers better stability and handling. However the Speed offers something they call Speed3 steering or run/jog/walk. I just had to give this a try. Obviously the walk was full swivel. Its easy to push and light. The "jog" is where we opt for the 30 degree swivel function. The front wheel can be locked to turn slightly for only 30 degrees in either direction. My jog days I interpreted to be my easy runs days, where I am trying to keep my paces 90 seconds to 2 mins slower than my half marathon goal pace. I was doubtful at first, I won't lie, but when I used it I really enjoyed it. It not only made turning easier, but it also kept me in check for my paces. If I sped up too fast (for me) the wheel was not as stable meaning it would easily shake over certain terrain. It's almost like a secret trainer partner wagging a finger at me when I try to do more than I should be doing. I of course keep the wheel completely fixed on any hard runs and even then the stroller handled great. Easy to push and maneuver. Also made easy by a tremendous amount of possible stroller handle heights. I have never seen a stroller with so many possible angles for the stroller handle and they all come in handy for Dave and me (if you didn't know, um Dave is shorter than me). With every stroller I have tried, I find something valuable that contributes to my running. However, in all honesty I also look at each stroller in terms of Asher: his needs and his behaviors. With all the positives this stroller has we have noticed some challenges in terms of Asher's full body hyper extension episodes or as some might call it when they see it - fits. The canopy clips in easily to the side but with that it also clips OUT easily. Asher, in his moments, pulls out the canopy a lot and sometimes unintentionally aggressively. It is something that we worry one day he might break. Cross fingers for us. I think if it actually clipped in with a latch of some sort it might be "Asher proof". Also, the stroller comes with a belly bar. This is great for perhaps typical children to clip on toys or to use their snack tray. For Asher we had to take it off (it does come off and is not needed to use the stroller). It only caused a big obstacle in getting to him when he was having an episode or a health issue. Also we are working on Asher being more independent with a goal of getting in and out of his stroller independently and eventually buckling himself in (we won't be teaching him to UNBUCKLE anytime soon. lol). The belly bar proved problematic. He couldn't understand how to get in or out with it attached. As I said in the beginning, I have been very fortunate to try many strollers. Also if you have been following my family for awhile you know I fell in love with one particular stroller nearly 3 years ago. It was the stroller that changed everything for Asher and me, but the season of that stroller has passed and we can no longer use it. For awhile now I have been trying to find the next winner winner chicken dinner. Now in a perfect world, where money isn't a factor (so fantasy really) strollers would be treated like running shoes. It is normal for a runner to have shoes in rotation: racing, workout, long run, etc. Strollers really are the same. Depending on weight, dimensions and the front wheel stability, certain strollers work best for certain types of running. But running strollers are EXPENSIVE ($$$$$) and not many people exclusively run with a stroller. I do though and money IS a factor. With the signing off of the first stroller Asher grew to love, this stroller has become a viable replacement. Eco friendly, light weight, easy to clean, comfortable (for him), pockets for all my stuff and his (the back seat pocket actually is two!) and the Speed3 front wheel really is an option that I didn't know all strollers should have. It opens up more training options for the frequent stroller runner or heck, all levels/paces of runners. I get a lot of messages asking me about strollers. They often start out with: "If you could pick one stroller..." and I always give a long thought out reply asking them about what type of runner they are, frequency and even their height (it makes a difference when picking a stroller) and then I give my opinion because it is just that, an opinion. Most recently someone reached out and she was very detailed on her needs, upcoming races and so on. I did my long spiel but in the end I did something I don't typically do and I gave a one stroller recommendation: the Bumbleride Speed. This stroller is a strong choice for an avid stroller runner and a once in a while stroller runner. It is multi-purpose, filling this gap in stroller running thinking. Stroller running is not all-or-nothing where you either run with a stroller and try to get faster, better, stronger or you just don't like it at all. This stroller welcomes in those runners who don't necessarily want to be a stroller runner, but perhaps need it for necessity on certain days or for easy runs. With all the running strollers on the market, this stroller checks a lot of boxes that no other stroller I have seen or tried addresses and when I was recently asked "If you could pick one stroller..." my answer was confidently Bumbleride. Eco friendly fabrics, multiple front wheel options, affordable accessories and a breeze to use makes this stroller a winner. * Disclaimer: Bumbleride supplied me with a Speed stroller. I was not financially compensated for this post. The opinions are completely my own based on my personal experience with this product.